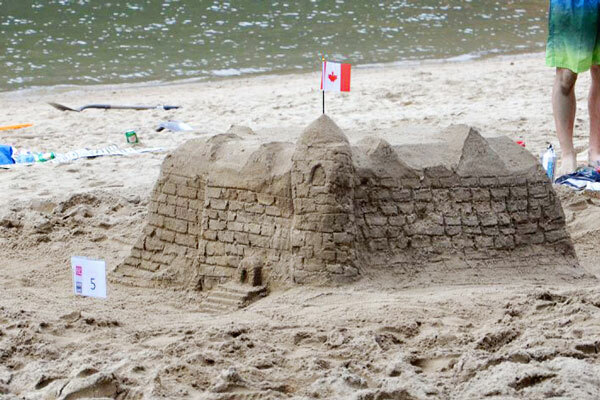 Lakeside Park for Canada Day 2018, eh? 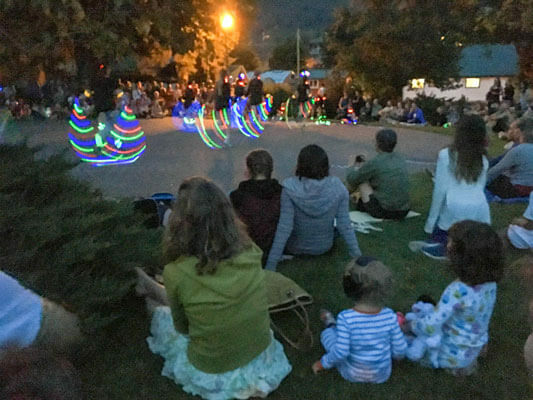 It seemed like at every family-friendly event in Nelson that we visited for the first time, there were smiling folks introducing us to another new awesome opportunity in our adopted city. 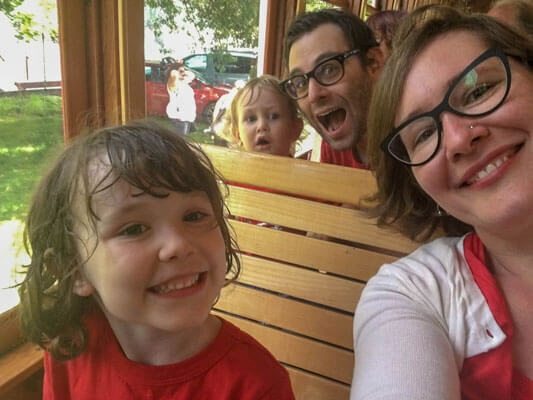 When our family ventured to Lakeside Park for our first Canada Day celebration there, it felt like one of those Annie moments. As soon as we arrived, we felt the Nelson vibe, and knew we were all going to enjoy ourselves. Across the whole park, from the concessions all the way to the shore, the festivities were in full swing. Red shirts with leaves - check! In a great example of members of the local arts scene coming together to plan a fun family experience, Stelio Calagias of Front Street Dance and Danielle Gibson from Dance Umbrella conspired to have Nelsonites randomly appear from the crowd and begin dancing a simple routine to Proud Mary, performed live by Stelio’s band, the Baker Street Blues. My dance-loving daughter jumped at the chance to be involved, while my little guy was just happy to bounce around in my arms. That’s Danielle on the left, daughter in tow, while Stelio is singing (off-camera)! And I can casually join a flash mob with my kids? "I think I'm gonna like it heeeeeeere..."
By the way, the Baker Street Blues are back on stage at this year’s festivities, alongside a great lineup of music all day long! Check out the schedule of live music here. 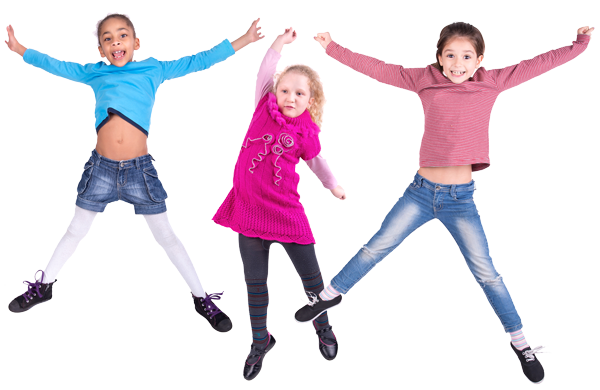 Fun activities for kids? You bet! 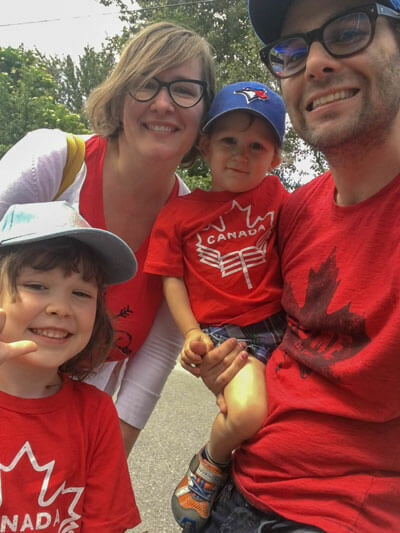 Family-friendly events in Lakeside Park are always a good time, and the Canada Day celebrations do not disappoint! 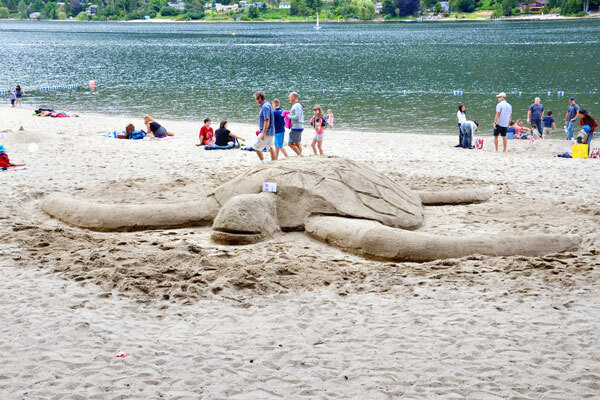 There are so many fun things for kids to do, from bouncy castles to getting a face painting to building sand castles to arts and crafts... all throughout the park! 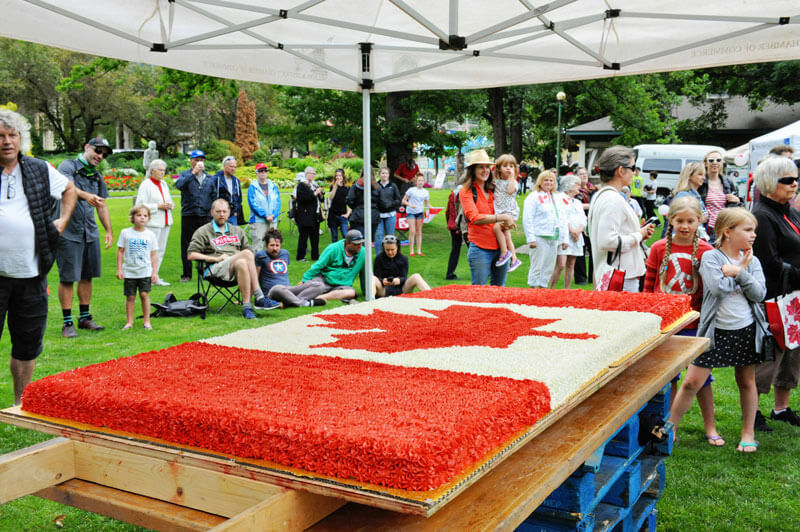 One of the traditions of this Canada Day event is the serving of a giant birthday cake. It's huge. Since it’s a super long summer day, jam-packed with fun, the kids were exhausted. We wanted to check out the fireworks, so we needed to take a break at home, where both kids passed out quick. 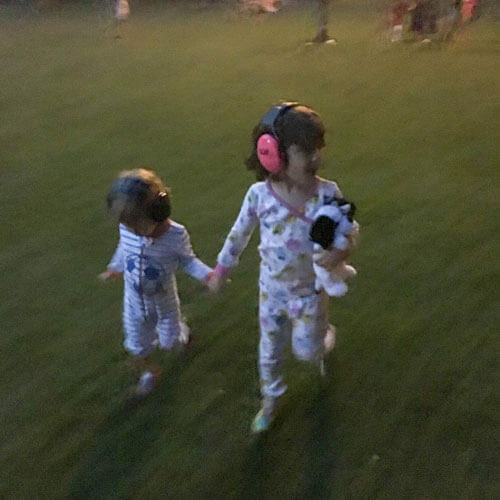 When we returned to the park for the evening activities, the kids were dressed in their evening wear: PJs, red hoodies, and noise-cancelling headphones. Past their bedtime. Can't hear anything. The colourful park scenes continued once it got dark, as festivalgoers with LED hula hoops and LED poi created mesmerizing rainbow trails. Later, we were treated to slick synchronized routines from the Nelson Rhythm Ropers and their glowing LED jump ropes. Don't skip the Nelson Rhythm Ropers! See Ya at Canada Day in Lakeside Park 2018! 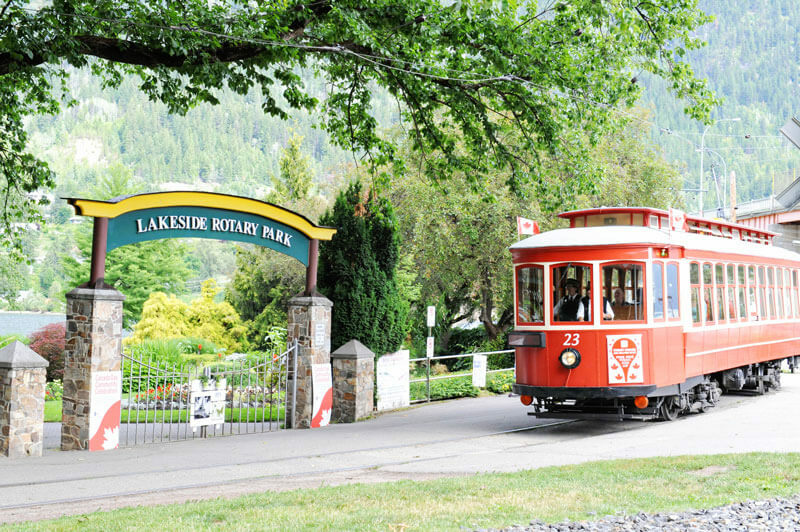 Organized by the Nelson and District Chamber of Commerce, and supported by community-minded local businesses and community groups, the Canada Day celebration is a real local community event. Everyone is so nice and generous - it makes you love where you live. Festivities begin at 10:30am, and run until the fireworks at 10pm. Nap times are whenever you choose. 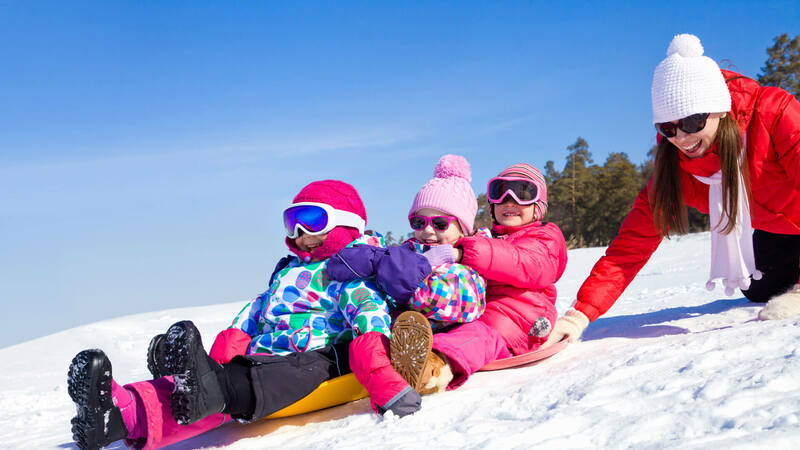 Wanna know about more upcoming events for kids and families in Nelson? We’ve recently launched our events calendar, where you can discover the latest fun things to do in and around Nelson. 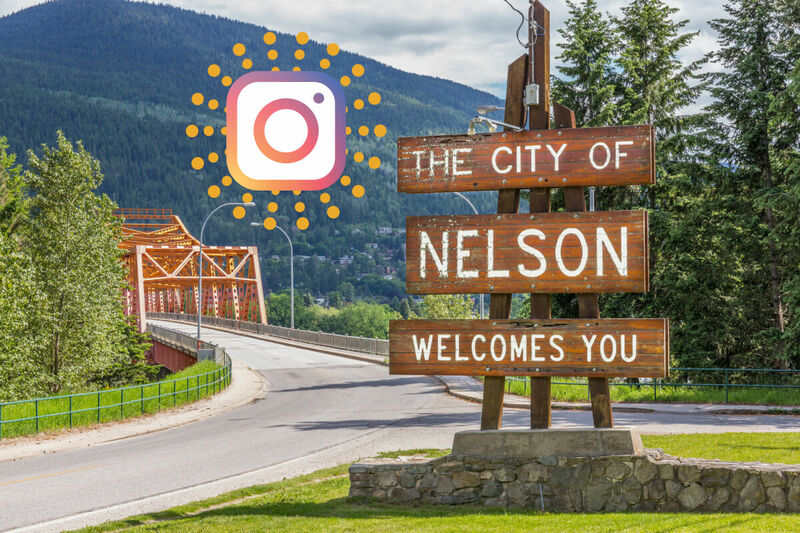 Plus, you can sign up for our newsletter, and we’ll keep you updated on what's going down in Nelson town. 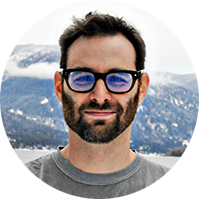 Avi Phillips is a guy who loves working from home in Nelson, where he gets to grow Nelson Kids with his wife, and spend as much time as possible with his cool kids in this amazing town. Sometimes Avi wears the hat of a theatre performer or director.